First I want to thank Maureen for allowing me to share here on Just Romantic Suspense. Romantic Suspense is my absolute favorite genre. In fact, all four of my books have stayed in this genre. The suspense element of the story always makes the romance feel more real to me. Do you agree? Anyway. 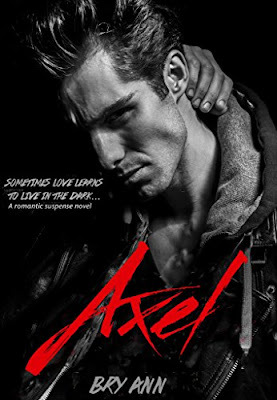 Today I wanted to share my book Axel with you. This story is very close to my heart and was written completely by accident. I was super angry at someone, furious actually, which is rare for me. I didn’t know how to cope, and didn’t want to say something I’d regret so I created this character who was chronically angry and said whatever he wanted. That was so fun and liberating for me. I am very filtered with what I say so I fell in love with writing him. ‘He’ become Axel. X. A pro fighter with extreme anger issues exacerbated by losing his best friend and the love of his life at a young age. After writing his pain and anger for a while the story felt unbalanced. Not only that but I missed the softer side of myself and writing. I didn’t intend for this to be a love story initially, but Aly came to me so naturally. She is everything Axel isn’t. Aly is escaping an abusive Christian home, and working to find herself. Their pasts catch up with them making it a story with more turns than even I could expect. I have completely fallen in love with them and I hope you do to! See below for an excerpt. Enjoy! When I got to the house I walked in, threw my keys on the stairs and let my purse fall from my shoulder into my left hand. He wasn’t on the couch where I‘d left him. I walked through the living room. The further I got in the house the more unsettled I felt. “X?” I called out as I headed into the kitchen. I glanced around the kitchen and didn’t notice anything until I looked at the door that led to the back yard. Blood. I held back a scream and held my purse closer as I walked to the door and started to open it. My heart was pounding uncontrollably in my chest because somehow I knew - I knew what I was going to see when I opened the door. Nothing could have really prepared me for what I saw. Ryan was holding X from the back with a gun to his head and X was bleeding… badly. Thank you guys so much for reading! I chose to tease the suspense element of this story, but trust me. This book is all about love and emotion. Thank you for taking the time to read this. I hope you check out my book, Axel, on Amazon. Just a note. As a gift to my readers, for everyone that leaves a review on Amazon and Goodreads I am giving a free ebook of their choice. Just message me the links. All my social media links are below!